Brilliant product does exactly as it says on the tin. I would definitely recommend this. Received order promptly. Charger functions perfectly. Good product. Easy to use. Just what I was looking for. Would use Tayna batteries again. Arrived promptly and found easy to use as it goes through an automatic check, charge and maintain charge routine. Had been having problems with a start stop battery becoming discharged. 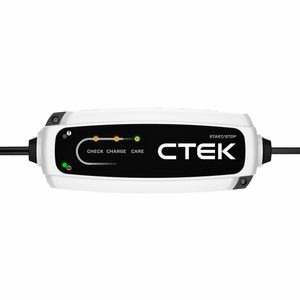 But a charging with CTEK CT5 seems to sort out the problem and it's easy to use. Works well with my Start/stop car. After purchase, the unit appeared to work correctly for a month or two. It then indicated a 'fault' by the red LED lighting up. It was not possible to quantify exactly what the fault was, so the unit was returned. Eventually the cost was refunded, but seller indicated no fault could be found.